Tech Policy Summit stories at Techdirt. stories filed under: "tech policy summit"
Why Do The People Who Always Ask Us To 'Respect' Artists Seem To Have So Little Respect For Artists? Over the years, we've posted tons and tons of stories of content creators embracing the internet, exploring the new opportunities it creates and often profiting greatly from doing so. We regularly celebrate the great creativity from these artists, and cheer them on as they succeed and (sometimes) make lots of money. And yet... there is a certain contingency out there who keeps insisting that we "hate" artists, or alternatively, that we have no respect for artists. This is bizarre. I adore artists and creativity. Part of the reason we spend so much time here discussing new business models and opportunities is that we want more artists to succeed. I have trouble understanding why that's so bad. At best, it seems to be a case of shooting the messenger. In order to embrace these new models it helps to recognize that the old models just aren't that good anymore. And that gets some people upset. So they shake their fist at the sky... and blame us because we tell them that having an umbrella might be a good idea. But one thing I find most troubling in all of this is that the very same people who constantly yell and scream about how we don't respect artists almost always make sure to mock and denigrate the quality of artists who do succeed these days. Take, for example, Jonathan Taplin, who (for reasons that escape me and many others) is the head of an "innovation lab" at USC, despite an apparent lack of understanding of the very basics of innovation. Instead, he pines for a historical fictional world that never existed. We wrote about some of his bizarre claims a few months ago. A few weeks ago, I was able to debate Jonathan at the Tech Policy Summit. Video of that should be going up soon, but it was more of the same. Taplin didn't have the facts on his side (he repeatedly made statements that were out-and-out false) and once he was called on it, he resorted to personal insults directed at me. First of all, nearly everything he says is wrong. Nina Paley can and does give her work away. You can (and, if you haven't already, should) go watch her excellent movie, Sita Sings the Blues. And, contrary to what he'd have you believe (that no one could possibly make money giving away content for free), Nina does make money. Finally, I'm really at a loss as to how one would ever be "forced" to watch anything they didn't want to watch. In fact, these days, with such a massive explosion in choice, the idea that anyone would ever be a captive audience forced to watch something they didn't like just doesn't make any sense. 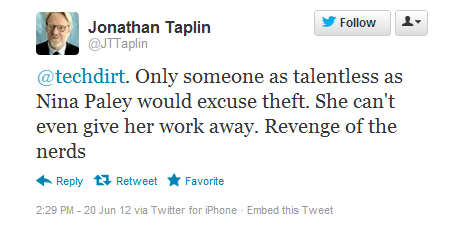 But the larger point is this unfortunate trend that we've seen, exemplified by Taplin's childish outburst here. The people who keep claiming that those of us seeking real solutions don't "respect" artists when we cheer and celebrate their successes and praise their artwork and creativity -- always seem to be the same people who mock and insult those very same artists' work for being successful. It's one thing to criticize their ideas. That's perfectly reasonable. But to take it a step further and insult their abilities as an artist is really quite shameful. 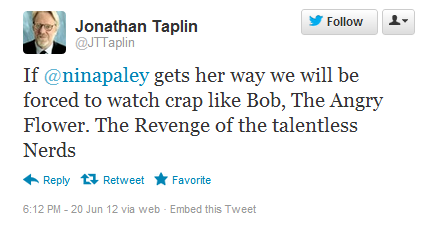 And that's doubly true when you're talking about someone who is a public figure like Taplin, a representative for USC. Is this really the face that USC wants to show to the world as its "director" of an "innovation lab"? Someone who mocks an artist and attacks her talent?